Lighthouse for the Blind (“LHB”) has been a DVS Group client since 2015 when they acquired Tear Mender. Last year, LHB acquired RapidFix. 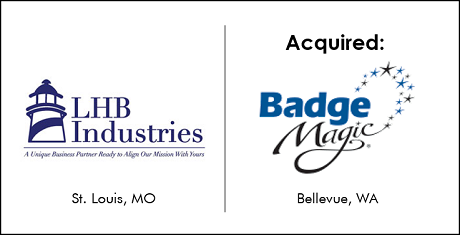 Hitting their fourth acquisition overall and third with us, LHB acquired Badge Magic in September 2018. The nonprofit employs 48 people who are legally blind in their two St. Louis County assembly and packaging plants. The sales revenues from these products support LHB’s community outreach programs. Dave Herzig founded Badge Magic in 2004 “after a two-year search for a better way to attach badges to Scout uniforms” (read the full story here). Badge Magic is an adhesive product that allows users to stick patches and badges to a variety of surfaces without sewing or ironing. A household Goo-Gone-like product can easily remove the Badge Magic adhesive. The product has become particularly popular with children’s organizations requiring badges – for example, Boy Scouts, Girl Scouts, and American Heritage Girls. The product has also been branded as CosBond to appeal to those creating costumes for cosplay. LHB started their acquisition search early in 2018. Dave Herzig responded to DVS outreach in May expressing interest in selling to LHB. After learning more about Dave and the Badge Magic product, it became apparent that the adhesive manufacturing would be a complement to the operations LHB is currently running with the Tear Mender and Rapid Fix products. LHB presented an LOI to Dave; they agreed to valuation and deal terms; and the dealmaking process moved to a close smoothly. The transaction closed on September 21, 2018. ← New World Natural Brands Acquisition of Suki, Inc.